The Medical Alert Wallets, Credit Card ID leather bi-fold Medical wallet is made from genuine leather in colors, Black or Dark Brown. 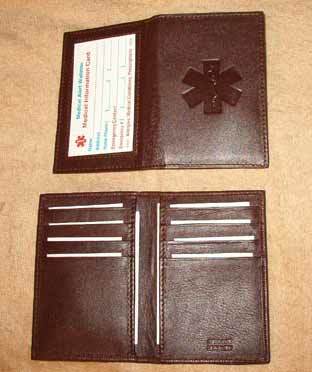 These bi-fold leather wallets have the Medical symbol debossed natural on the outside. 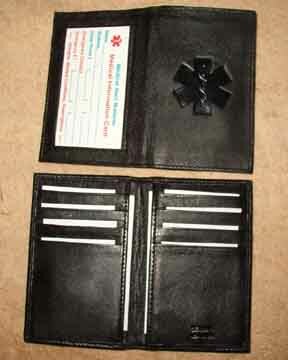 Inside these Credit Card ID leather bi-fold wallets there are 8 leather credit card slots, 2 pockets, one on each side, one goes through to the clear ID window towards the outside, as shown with the Medical Information Card in the picture to the right. Note, there is No currency holder. Size; 3" wide by 4 1/2" high by 1/4" thick closed & empty, 6 1/4" wide by 4 1/2" high opened. 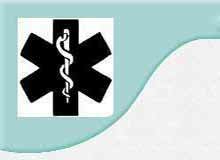 If you have any allergies, medical conditions and take medicines, then you should have a Medical symbol on you somewhere and with the Medical Information Card which you've filled out with your current medical information. 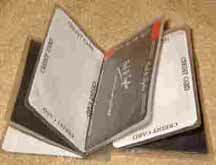 NOTE, this credit card holder insert is NOT a wallet by itself!